So today's polish is called 35 홀로그램 핑크 (read it as "Hologram Pink") from Aritaum. 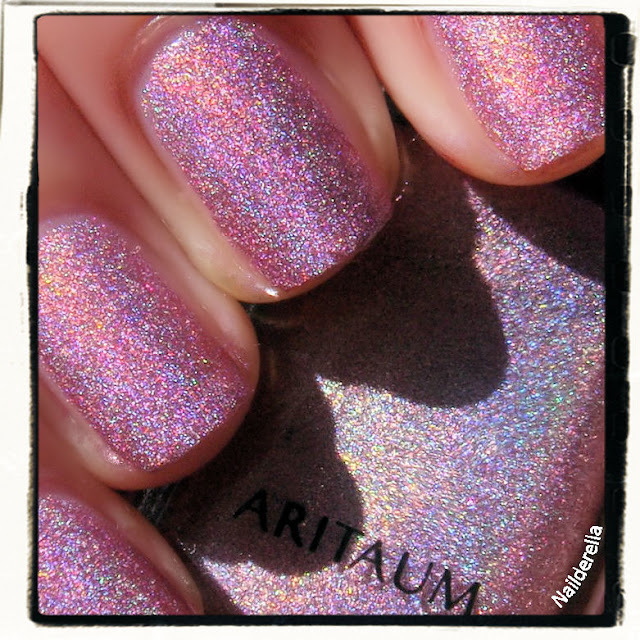 Aritaum is a Korean cosmetics brand and they also have some gorgeous nail polishes. In their shop, there were 2 lovely holos (a pink and a purple). So I just grabbed them and was so happy to find them because they looked really holo in the bottle. It's a rather soft pink with a lot of purple in it. What is quite amazing and funny is that it is nor a pure linear holo nor a pure scatterd holo. It's something in between. It has a bit of both types of holos at the same time. In the shade, it's more scattered but in the sun, you can see some slight linear holo that comes in. But I would rather say it's a scattered holo (if I had to chose between the 2 solutions :p ), but a very stong scattered holo. Normally scattered holos are quite weak but here, it's really strong. So it's totally unique to my stash! Happy! I used 3 coats but you can easily go with 2. I tried to apply 3 in order to see if the holo effect deepens or not. But really, this was not necessary. Application was super easy. It applies smooth and lovely. The brush is wide but not too short, looks like OPI brush. 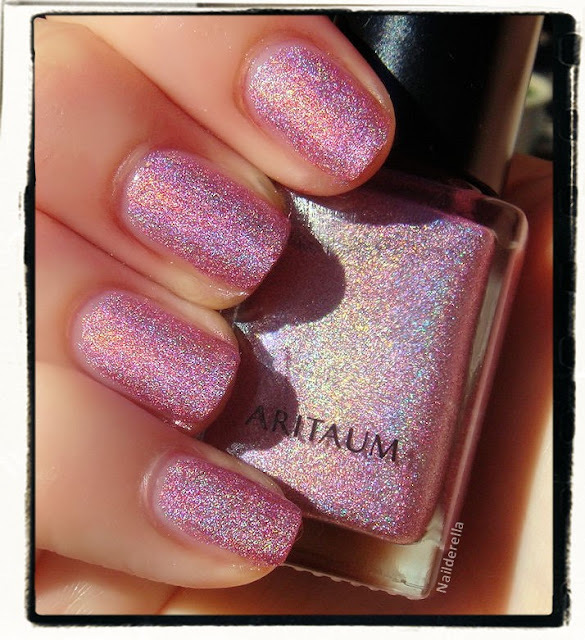 Aritaum nail polishes cost 4000 ￦ (3.7$). Final verdict: Koreans really know how to do amazing holos. 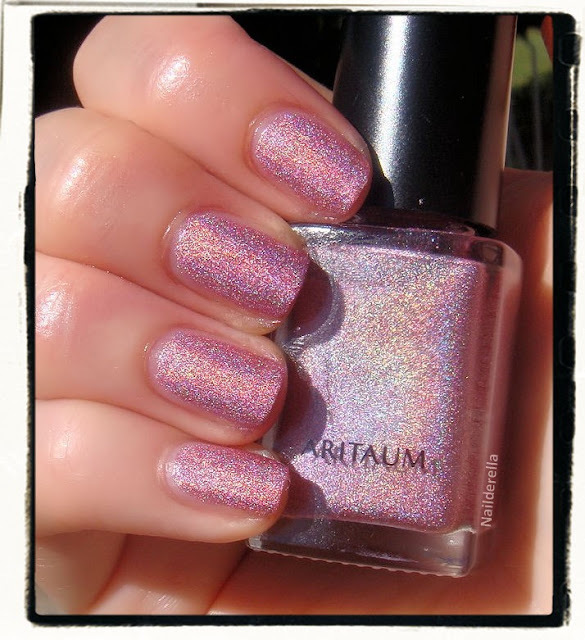 I love the color (although it's not a super special color) and the super strong scattered holo effect. I didn't have any strong scattered holos so I am super happy to have found this lovely polish. Other scattered holo that I know are much weaker compare to it. Moreover, application was flawless, it dries really smooth, and glossy, and even its price is interesting. Never heard of this brand either! So pretty! I love holos! 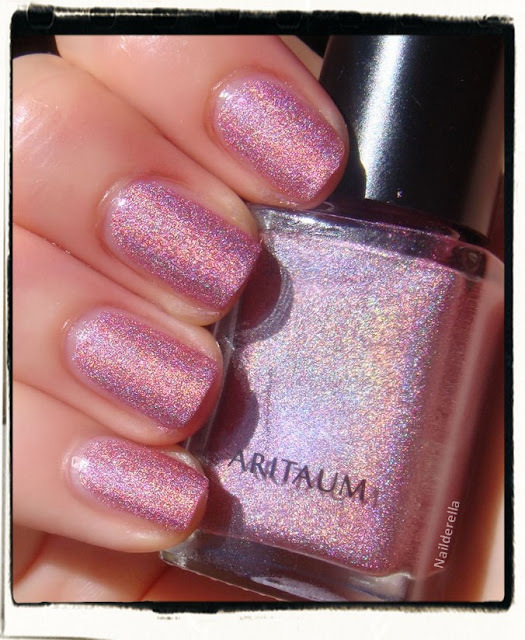 That is a beautiful holo! That's sooo pretty, I love it! I've never heard of this brand but this is a gorgeous color! I love holos. This is such a pretty color! Never heard of the brand, but the polish looks amazing! You got some great photos! thanks for your lovely comments, ladies!! I really appreciate every single one!! I have never seen this brand before, it looks fkrn amazing!!! I think I'm in love! This polish is gorgeous!